This creation was made out of necessity and trying to use whatever I could find in the refrigerator. I was originally planning to make a hotdog for merienda the other day but I found out that the hotdogs were solid frozen and we didn't have any hotdog buns. I saw some hamburger buns on the table so I figured I'd use that instead. And since I didn't want to wait for the hotdogs to thaw (even if I could just defrost it in the oven), I decided to open a can of vienna sausage and slice them into flat portions. I checked the ref for some other ingredients I could use and happily found mayonaise, mozarella, pickle relish (sweet though, I like dill pickles more), cheese, lettuce. And since I wanted more, I put mustard, ketchup and sprinkled some bacon bits. 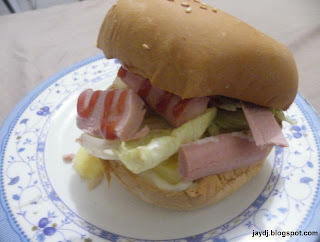 And so my vienna sausage burger grew and grew. I had to squash the burger to fit in my hand and mouth. I think I'll make one of these babies again soon.